Bay leaf, also referred to as laurel leaf, is frequently used to flavor soups, broths and meat dishes. But don't sweat it, if you don't have any on hand. One of these herbs will do just fine as a substitute. Substitute 1/4 tsp. dried thyme or oregano, for each bay leaf or 1/4 tsp. crushed bay leaf called for in the recipe. Have dried bay leaves, when your recipe calls for crushed, or fresh bay leaves when your recipe calls for dried? While bay leaves add flavor and fragrance to any dish they're added to, they are quite tough and bitter tasting on their own. For this reason, whole or crushed bay leaves are usually removed before serving the dish they're in. What Are Bay Leaves Anyway? 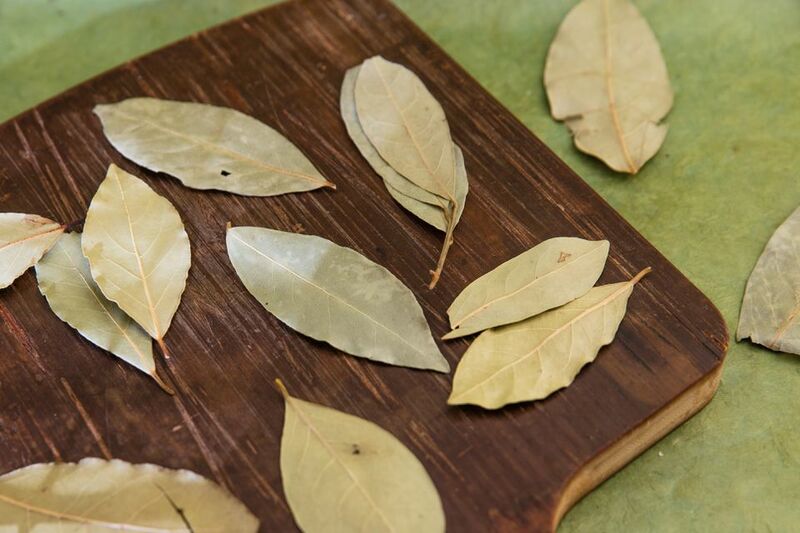 When European or American recipes call for bay leaves, they're typically referring to the leaves of a bay laurel tree. In other cuisine, bay leaves may refer to the leaves of a different member of the laurel family. While the flavor of the different types of bay leaves can be quite different, they're usually added to the same sorts of recipes. You'll typically see them featured in soups, stews, broths, and meat or vegetable dishes. They contribute to both the flavor and fragrance of the dish. Just don't get inventive and add more bay leaves to a recipe that what's called for. Too many bay leaves can result in a bitter taste. Dried bay leaves lose their flavor quickly. Replenish your supply every six months, but don't throw the old ones in the trash. If you sprinkle them around your pantry, they'll help to repel moths. Bay laurel is originally a native of the Mediterranean, but it can be grown in the United States. It suitable for outdoor planting in zones 8 through 11, and can be grown as a houseplant everywhere else. Left in its natural state, it can reach 60 feet in height, but it's easy enough to prune a bay laurel to keep it small and ornamental. Six feet is a typical height for a potted bay laurel. Keep your bay laurel indoors in the winter. Then, move it outdoors in the spring. Since bay laurels are evergreen, the leaves can be harvested at any time. Many people who grow them opt to remove leaves as they need them, and since fresh bay leaves are much more flavorful than dry, that's certainly the way to go, if you have access to a tree.